Italian researchers have devised the first soft robot that moves just like plants. 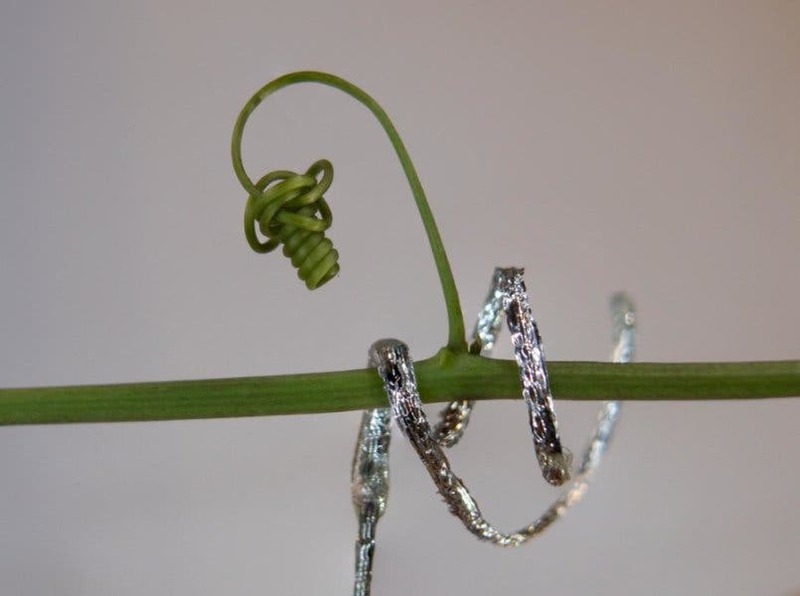 The tendril-like soft robot curling around a Passiflora caerulea plant stalk. Image credits IIT-Istituto Italiano di Tecnologia. Able to curl and climb, the new soft robot could inspire the development of wearable devices able to actively change shape, researchers report. The tendril-like bot is the brainchild of a team at the Istituto Italiano di Tecnologia (IIT), led by Barbara Mazzolai and uses the same water transport system employed by plants in order to move. Mazzolai has extensive expertise working with plant-like robots. She coordinates the EU-funded project “Plantoid” — that aims to create the first viable plant-inspired robot — and has a background in biology with a Ph.D. in microsystems engineering. Her team included Edoardo Sinibaldi, an aerospace engineer with a Ph.D. in applied mathematics, and Indrek Must, a materials technologist with a Ph.D. in engineering and technology. They took direct inspiration from the way plants move in nature. Plant movement is mainly associated with growth, the team explains, and they continuously adapt their morphology to their environment. Most of this movement is associated with roots and other unexposed areas of plants, but even organs exposed to air (such as the leaves of carnivorous plants or the tendrils of climbing plants) are able to perform movement to favor the organism’s growth, they add. Such movement is supported by water transport mechanisms inside plant cells, tissues, and organs — and the team replicated these mechanisms in their artificial tendril. This way of performing movement is built upon the hydraulic principle of osmosis, which is based on the presence of small particles in the plants’ intracellular fluid (cytosol). The team started with a mathematical model to help them gauge how large a soft robot — one that moves using the above mechanisms — should be. This step was required to avoid cumbersome bots. Armed with their ideal dimensions, the team shaped their robot as a small tendril. This bot is constructed out of a flexible PET tube filled with a liquid rich in ions (electrically charged particles). A 1.3-volt battery powers the whole contraption. When an electrical current is run through the liquid, the ions are attracted to and immobilized on flexible electrodes at the bottom of the tendril. This movement causes movements in the liquid at large, which in turn powers the movement of the overall robot. It’s not very fast, but the mecha-tendril can perform fully-reversible movements, just like those seen in real plants. To reset its movement, the team simply needs to disconnect the battery. This study is the first to show that osmosis can be used to power reversible movements in robots (it’s not the first plant-robot, nor the first plant-like bot that can move). Having successfully done this using common materials (a commercially-available battery, some PET plastics, and common fabrics) suggests that the technology can be easily and safely adapted to interactions with organisms and objects. Some of the applications the team envisions range from wearable technology to flexible robotic arms meant for exploration. Mazzolai and her research team want to continue imitating plant movement for robot use in the future. They’re currently involved in coordinating “GrowBot,” a project funded by the European Commission under the FET Proactive program. GrowBot aims to develop a robot that is able to manage its own growth and adaptation to the surrounding environment, with the ability to recognize the surfaces it attaches to or the supports which anchors it — just like climbing plants. The paper ” A variable-stiffness tendril-like soft robot based on reversible osmotic actuation” has been published in the journal Nature Communications.